Acne just appeared at the worst time? Don’t panic — read this guide on how to handle skin breakouts the right way. It always seems that when you’re having the best skin of your life and everything is going well, SUDDENLY your “favorite little friends” decide to pay a visit. Yes, I’m talking about sudden acne. Skin breakouts are the worst because they’re unexpected, you never know when they’re going to leave, and if handled the wrong way they can leave behind scars. So how do I get rid of breakouts as soon as possible without leaving a scar? 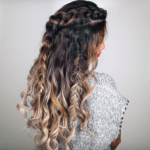 Our immediate reaction when encountering these breakouts is to go in a state of panic, but do not fear because there are some concrete steps you can follow. Below, I’m sharing my process on how to prevent and treat these pesky blemishes! Get ready to confidently face skin breakouts from now on. 1. Don’t Pick Your Pimples! Everybody makes mistakes, everybody has those days, you say (cue Hannah Montana’s “Nobody’s Perfect”). However, you need to try as hard as you can to not make this particular mistake when you have acne. I can’t emphasize this enough — do not pick your pimples! 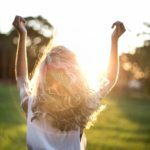 Not only does picking spread bacteria (which can trigger additional breakouts) and create scars, but it’ll elongate the healing process for your breakout. So basically it makes EVERYTHING worse. Don’t do it. If your skin breakouts mainly consist of whiteheads, that usually means that you’re under-exfoliating. If you don’t properly exfoliate on a regular basis, your dead skin cells can pile up and block your pores, which causes oil to build and whiteheads to appear. Exfoliating is just as important as cleanser to your skincare routine because it allows new skin cells to appear and for skincare products to effectively absorb into the skin. Meanwhile, those breakouts that consists of hard red cysts are usually caused by hormones and are a bit harder to get rid of than whiteheads. 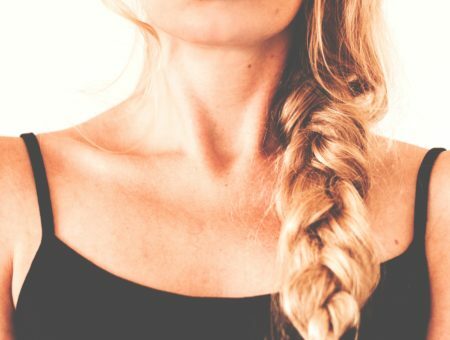 For red cysts, you should use exfoliators that contain salicylic acid (gets rid of excess oil) and then calm the swelling before you apply treatments that have benzoyl peroxide (immediately kills bacteria). To further shrink and help soothe the cysts you can use a spot treatment that has hydrocortisone! 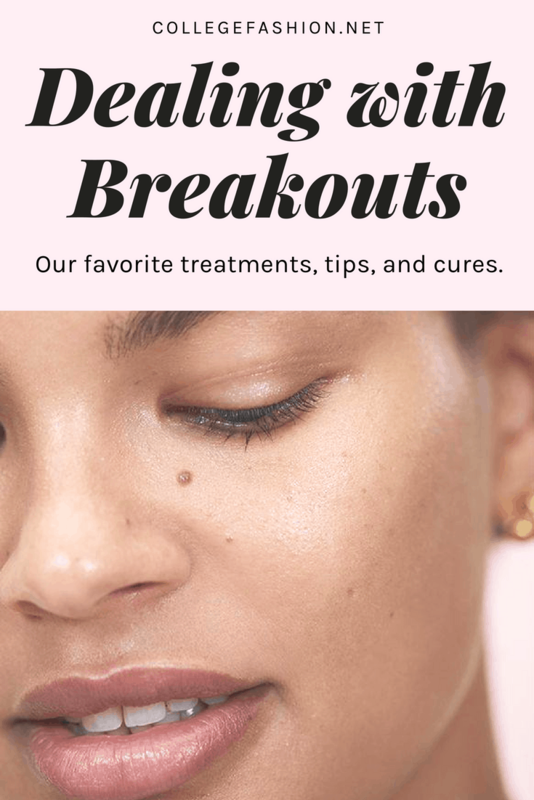 Now that you know the basics of dealing with breakouts, here are some spot treatments I personally recommend. 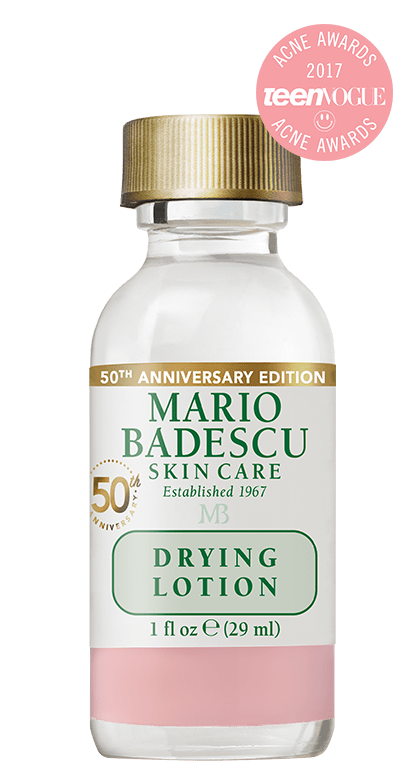 An overnight treatment that I love and have been using since one of my cousins introduced me to it years ago is the Mario Badescu Drying Lotion ($17). Not only is it my #1 go to for getting rid of acne, but it won the 2017 Acne Award from Teen Vogue and is a go-to on the spot treatment for celebrities, as well as beauty and skincare professionals. Ideal for all skin types, this treatment features salicylic acid, which helps unclog pores and is perfect in getting rid of blackheads or whiteheads. Don’t shake the bottle and instead dip a q-tip in and dab the pink solution onto the infected area and go to sleep! The next morning, you’ll wake up and your blemish will be dried up. If you don’t have time to use treatments the night before and you have to hide certain pimples ASAP than the next solution is to use a cover-up. There are various cover ups that you can use to immediately hide pimples such as treatment concealers, but my particular favorite cover up product is an Acne Pimple Patch. 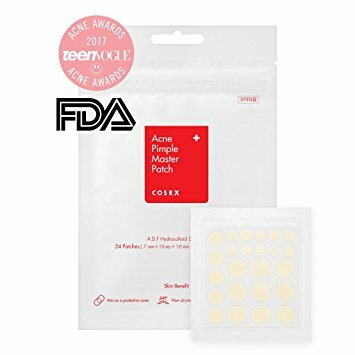 Cosrx Acne Pimple Master Patch ($5) is an acne treatment that can be used overnight or during the day to cover up whiteheads, blackheads, and zits. For the best results, use overnight, but in a pinch, they can work during the day. These patches fight infection and bacteria, get rid of blackheads and whiteheads, and reduce the size and healing time of cystic acne. They’re miracle workers! Also, these little clear patches have the same texture as a hydrogel sheet mask, so they’ll stay on during the shower or even when you wash up. 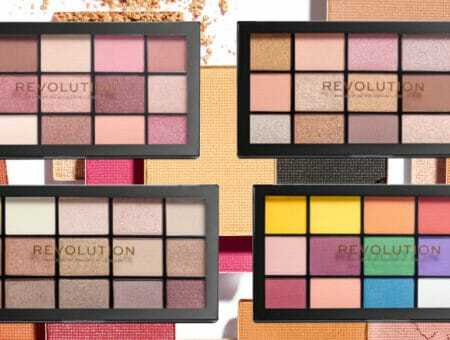 Furthermore, they come in three different sizes so you can pick and choose which one covers your acne the best. What Are Your Go-Tos When You Have Skin Breakouts? 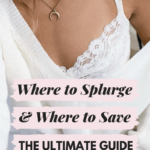 I hope this guide helps you on your next breakout and that you’ll say good bye to acne and hello to only good skin days! Leave comments below if you have any tips in getting rid of acne breakouts!